How can we feed the world�today and tomorrow? The biggest players in the food industry�from pesticide pushers to fertilizer makers to food processors and manufacturers�spend billions of dollars every year not selling food, but selling the idea that we need their products to feed the world. But, do we really need industrial agriculture to feed the world? Can sustainably grown food deliver the quantity and quality we need�today and in the future? Our first Food MythBusters film takes on these questions in under seven minutes. So next time you hear them, you can too. Turning Point in the Food Fight of Our Lives: We Need Your Help More than Ever! 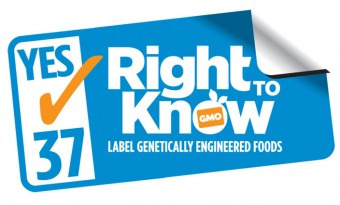 The most recent voter poll on the November 6 Proposition 37 California ballot initiative to label Genetically Engineered foods and ban the marketing of GE-tainted foods as �natural� is out. And the news is discouraging. After enjoying a 26-point lead for the past six months, our side has dropped 19 points in the polls. How did we lose so much support so fast? If you live in California, you know why. Flip on your TV � at home, at the gym, in the airport � and there they are. Ad after ad, spewing lies about higher costs for consumers, rampant lawsuits clogging the courts, �confusing� labels, poor farmers and grocers facing �nightmares of paperwork.� Monsanto, Big Ag, and the rest of the pesticide and junk-food manufacturers began flooding the California airwaves on October 1 with one million dollars a day in deceptive TV and radio ads � and they will relentlessly pound the airwaves right up until midnight November 6. We�re still ahead in the polls 48% to 40%. And we�re holding onto a comfortable lead among those who don�t watch TV. But those who do watch TV � including many who were on our side until the opposition unleashed a barrage of non-stop industry propaganda and lies � are getting confused. With only a few million dollars in our own campaign war chest, we�re no match for Monsanto�s $36 million ad blitz. So, how do we overcome Monsanto and Food Inc.�s onslaught of deceptive advertising? We do what the grassroots knows how to do best � we fight back on the ground with our message about the people vs. the corporations, the truth about our health vs. their obscene profits. We expose their lies by talking to voters in supermarket parking lots, on the phone, and by making sure voters get out to the polls to vote YES on 37. Here�s how you can help. If you live in California, we desperately need you to hand out leaflets at grocery stores over the next three weeks � we need to mobilize thousands more of you today! Sign up here. ***If you live outside California, please volunteer for our national phone bank to call millions of California voters. It�s easy. You can get quick, easy online training and sign up for one or more shifts here � and it won�t cost you a dime in phone charges. And of course, we need to raise as much more money as possible, to be able to keep the campaign running. If you haven�t donated yet, please consider a donation today. If you have, please consider an additional donation. To help OCA and OCF continue to financially support the Prop 37 campaign, donate here. The decisive moment has arrived. Everything we�ve worked for in the past 15 years is on the line. We desperately need your money, your volunteer time, or both. Thank you! Excellent video! Since I can't vote for 37 at least I contributed my share (what a looong way to the donation buttons, they should have been on top of their site, not at its end) Monsanto's hand has looong fingers. Thx Kit, hope many will see and read this. Thanks Kit for helping get the effort maximized in CA; I'd send you a green star if I could! Hi Kit B. Congratulations: You expressed yourself so clearly in writing about the food industry. Quote: "The biggest players in the food industry�from pesticide pushers to fertilizer makers to food processors and manufacturers�spend billions of dollars every year not selling food, but selling the idea that we need their products to feed the world." Noted but failed to sign for unknown reason.I'll try again. Thanks Kit. Informative video, noted, Thank you Kit. Thank you, Kit. Japanese people have shown that it's quite possible to live well without GMOs or pesticides. The producers of those products spend a lot of money and do their best to persuade the world their products are necessary to feed people. Great video. Should be shown in the schools but private dollars is not allowing that and they want to have more not less control in our schools. We all need to teach the children before they get hooked on lies and outdated ideas that were fed to us. Signed the petition for prop 37 a while ago. Good video though! If there was another petition after the video it didn't let me go to it? Would not work for me, Kit. I'll try again later. Thanks, Kit, but I was unable to locate the petition. I'll take another look at it later this morning. Noted but could not find the petition to sign.Watched the video too.I don't want to eat anything that is "genetically engineered". I am an organic gardener...farmer on a small scale.Why not put $$$ into beneficial insects,companion planting,green manure crops, and so forth. We need to focus on quality of life issues not more death and destruction. Noted. I didn't see a petition either, but have signed a few already. Noted. I haven't seen the petition.